Waveny House Wedding Photos capture images from a weddings at truly beautiful venue. Waveny House is a Town of New Canaan municipal building, located in the scenic Waveny Town Park. The estate is managed through the New Canaan Recreation Department, who also organize wedding events at the location. The mansion was originally built in 1912 in the style of the Tudors. It was owned by the Lewis Lapham family until 1967, when it was sold to the town and preserved as a historical space. Waveny House Wedding Photos show this history and the elegance of the mansion. This image from a Waveny House wedding, however, does not show many details the setting, it focuses instead on the happy face of the bride. 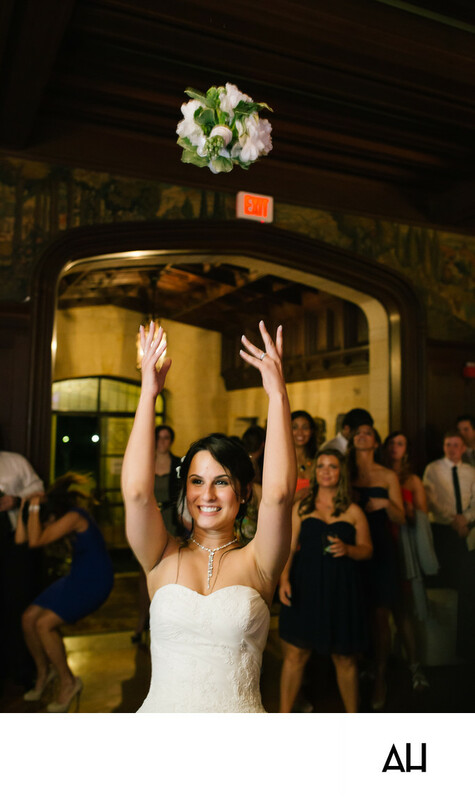 The flash of the camera freezes the moment when the bride, with her back to the guests, tosses her bouquet over her head. Wedding guests stand expectantly in the background, eyes on the flowers as they soar through the air and arc beneath the venue’s ceiling. The bride glows in this moment, as she passes off her flowers to the next bride-to-be. The bride’s gown is gorgeous, with a sweetheart top and subtle designs adding a touch of detail to the fabric. She also wears a diamond necklace, that begins as a choker and then trails down the to the bodice of her dress like sparkling tear drops. The highlight of the photo is the expression of joy that is so clear on the bride’s lovely face. Her smile is wide and her eyes alight with merriment, as she participates in the celebrations that honor her and the man she now calls her husband.